One of the first watches to bring optical heart rate monitoring to the wrist, the Mio Alpha was pretty ground breaking when it arrived on the sports tracking scene. Now Mio is back with the $199 Alpha 2. It's up against far tougher competition with lots of fitness trackers choosing to give us BPM updates minus the chest strap. 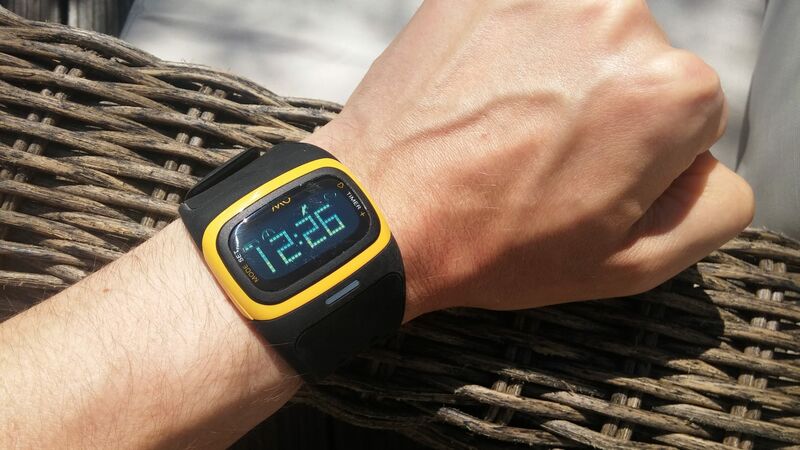 So has Mio's latest fitness watch got what it takes to keep our hearts racing? Looks-wise there's no doubt that the Mio Alpha 2 is a wearable built for sport. And an attractive one at that. With a nice ergonomic curved screen that's integrated almost seamlessly into a familiar soft silicone strap, it's one of the better looking fitness watches we've seen. There is a caveat. Despite the fact it comes in three different sizes, the strap and face are still pretty wide so if you've got small wrists then the Mio is going to come up pretty big. The watch face features two buttons neatly integrated to the left and right of the old school LCD digital display. These are so well integrated, in fact, it's actually hard to find them the first time. But you'll forgive that for what the Alpha 2 gives back in sleek looks. Once you've found the buttons, working out what they do is also a bit of a struggle. These days we're so used to Apple-esque simplicity that the notion of going into the manual feels like a fail. Sadly, the Alpha 2 had us flummoxed, forcing us to flip pages to work out the controls. There actually aren't that many as the Alpha 2 is pretty restricted in terms of its feature set. But somehow they've still managed to make the limited functions hard to fathom. Following the paired-back theme, the Alpha 2's display itself gives you fairly limited info with icons for battery life, current mode, heart rate indicator and heart rate BPM during a workout. There's also a little coloured LED light just below the screen that flashes a different colour to give you a nice visual reminder of which heart rate zone you're working in. Meanwhile, vibrating alerts give you a gentle jolt when you drop out of the zones which also makes it easier to ensure you're working to get the right training effect. During a workout, use the left button to scroll through a series of stats including a simple timer, calorie count, pace, distance and of course current heart rate. There's actually two types of heart rate training modes to choose from: one that tracks you and alerts you when you're moving outside of a single zone and a second mode that keeps tabs on your BPM across all five training zones. Although the Mio Alpha can count your steps during a workout, for some strange reason they've decided not to use that functionality to track your everyday movement. It feels like a missed trick in a watch that desperately needs more features. Another glaring omission is the lack of built-in GPS with pace and distance stats calculated using an accelerometer. While runners and cyclists will find that a little hard to swallow, swimmers will be pleased to hear the Alpha 2 is at least water resistant up to 30 meters (3 ATM). If you're frustrated with the lack of features, the Alpha 2 could be paired with your smartphone, adding heart rate monitoring to the functionality that these brilliant apps already offer. The Alpha 2 was fast to detect heart rate, picking up our BPM within ten seconds every time we used it in testing. Up against the Polar M400 with a chest strap the stats were nicely consistent. While not entirely a scientific test there's at least anecdotally an equal level of accuracy in the Mio and its chest-worn competitor to keep us satisfied. One thing we'd love to have seen included is a feature that fires the optical heart rate automatically every hour or so during the day to help build a more complete picture of how heart rate, including your resting rate, varies. With smart garments on the horizon that are likely to offer this, fitness tracking watches will need to compete and this would have have been a welcome additional feature. While the Mio Alpha 2 has enough on-board storage for up to 24 hours of workout stats, your data can also be automatically synced with the partnering Mio GO smartphone app for iOS and Android using Bluetooth Smart. We're sorry to say that Mio GO lacks any kind of finesse. The automatic syncing only worked intermittently and even when we had managed to get our data across, what the app gives you is nothing to write home about. The basics are all there, like pace, speed, average and maximum heart rate along with calories, distance and the heart rate zone you spend most time in during your session. But that's it. And as far as we could see, you have to tell the app in retrospect what you were actually doing, whether running, cycling or swimming etc. One major omission is that the app lacks any monthly totals overview. There's no way of seeing how you've been progressing over time or any way to compare workouts. Add to this the lack of community, social sharing or rewards and it all feels a bit flat. If simple, fuss-free is your thing then this might strike a chord with you but all in all we've come to expect more. Mio claims its lithium-polymer battery will run for up to three months in simple watch mode while we found you'd get somewhere around 20 hours of tracking in heart rate mode from a single charge. The Mio Alpha 2 comes with its own unique charging dock and while it's certainly far from the only device that takes this approach rather than straight forward Micro USB charging, it's no less frustrating. Particularly as the Mio's dock is attached to roughly 2cm of cable. Useless if your plugs are more than 5cm from the floor. If you like things paired back, all you care about is heart rate tracking and you've got money lying around, this might just be your perfect heart rate monitor. But for everyone else the Mio Alpha 2 probably just doesn't have enough. It carries a fairly premium price tag for a fitness tracker without packing the breadth of features to back it up. So while it looks good, is comfortable to wear and delivers accurate heart rate training data, with so many capable fitness trackers, smartwatches and smartphone apps on the market, the Alpha 2 just feels like it's been left a bit behind.